Percutaneous endoscopic gastrostomy (PEG) is a commonly performed procedure. Iatrogenic injury, mostly liver and colon, is a known complication of PEG placement. 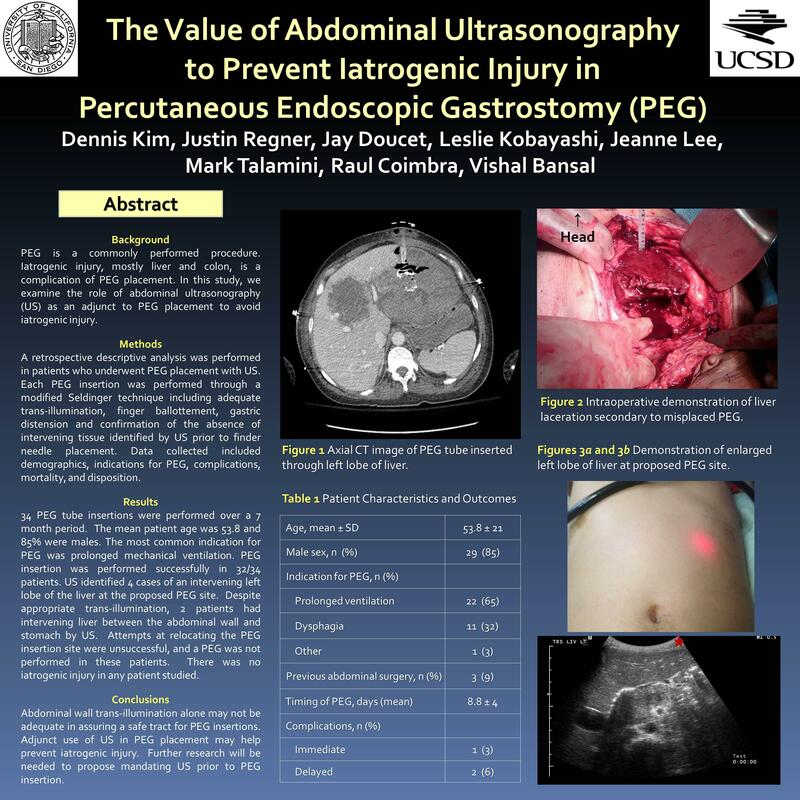 In this study, we examine the role of abdominal ultrasonography (US) as an adjunct to PEG placement to avoid iatrogenic injury. A retrospective descriptive analysis was performed in patients who underwent PEG placement with US. Each PEG insertion was performed through a modified Seldinger technique and a safe tract for passage was verified via adequate trans-illumination, finger ballottement, gastric distension and confirmation of the absence of intervening tissue identified by US prior to finder needle placement. Data collected included demographics, indications for PEG, complications, mortality, and disposition. Thirty-four PEG tube insertions were performed over a seven month period. The mean age was 53.8±21 years and 85% (29/34) of patients were males. The most common indication for PEG tube insertion was prolonged dysphagia (22/34). PEG insertion was performed successfully in 32/34 patients. US identified 4 cases of an intervening left lobe of the liver at the proposed PEG site. Despite the presence of appropriate trans-illumination, 2 patients had intervening liver between the abdominal wall and stomach by US. Attempts at relocating the PEG insertion site were unsuccessful, and PEG tube was not performed in these patients. There was no iatrogenic injury in any patient studied. Commonly used indicators including trans-illumination may not be adequate in assuring a safe tract for PEG insertions. Adjunct use of US in PEG placement may help prevent iatrogenic injury. Further research will be needed to propose mandating US prior to PEG insertion.